For all the super-cool and otherworldly space vehicle and satellite concepts that NASA engineers dream up, only a very small percentage of them ever make it off the drawing board and onto the production line. 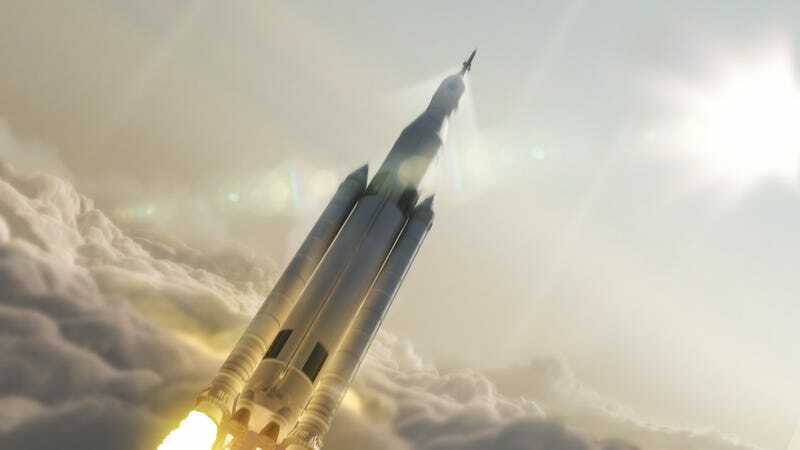 But the next generation Space Launch System is now part of that select few, having completed NASA's rigorous review process and been found worthy of actual development. NASA announced the the verdict of what's known as Key Decision Point C—the final review before a program transitions from the initial, conceptual "formulation" phase to the implementation phase, wherein the actual bits and pieces of the spacecraft are constructed. The KDP-C establishes a baseline program cost—$7.021 billion—based on NASA's Best Practices data and sets a chronological limit on that baseline of November, 2018. In fact, the SLS is the only exploration-class vehicle to make it out of the formulation phase and into development since the space shuttle. This is a huge deal for NASA's proposed missions to Mars and for human space exploration in general. "Our nation is embarked on an ambitious space exploration program, and we owe it to the American taxpayers to get it right," said Associate Administrator Robert Lightfoot, who oversaw the review process, in a review statement. "After rigorous review, we're committing today to a funding level and readiness date that will keep us on track to sending humans to Mars in the 2030s – and we're going to stand behind that commitment." Similarly, NASA has already independently reviewed the Orion Command Module and Ground Systems at their respective KDP-C. The Orion is slated for its first test flight, dubbed Exploration Flight Test-1, in December and the crawler-transporter 2 (CT-2) is currently being retrofitted to accommodate the new rocket's enormous weight and bulk. And now that the SLS portion has been approved, the rocket's fabrication can actually begin. Michoud Assembly Facility in New Orleans has all major tools installed and is producing hardware, including the first pieces of flight hardware for SLS. Sixteen RS-25 engines, enough for four flights, currently are in inventory at Stennis Space Center, in Bay St. Louis, Mississippi, where an engine is already installed and ready for testing this fall. NASA contractor ATK has conducted successful test firings of the five-segment solid rocket boosters and is preparing for the first qualification motor test. The SLS's own maiden flight, dubbed Exploration Mission-1, is expected to take place around 2017— or by November, 2018 at the very latest, since that's when the funding baseline expires. Should the three components of the new heavy-lift system continue to advance at their current pace, NASA hopes to plunk a team of astronauts onto the surface of Mars by the 2030's and leverage the SLS's powerful thrust to throw an entire generation of manned and unmanned missions further, farther, and deeper into space than we ever have before. Our parent's generation had the Space Race, an archaic and analog effort by today's standards that cost hundreds of millions of dollars just to break free from the Earth's gravitational hold and transit to our own celestial Gilligan, the moon. But that effort revolutionized Earth-bound technology as well—giving us new forms of communications, transportation—hell, you can even thank NASA for the Velcro on your Air Jordans.